Using this new delivery method, integrated project delivery (IPD) brought all major team members together early in the planning process. In IPD, the team members come together upfront and all share the financial risk and reward on the entire project. They commit to a guaranteed maximum price during the project’s conceptual drawing stage, long before final planning and design. “Some of the benefits of IPD really hold true, not only to us as a subcontractor but to the rest of the team as well,” Mr. Cramer noted. The entire process engages the different values of the various team members simultaneously. Dee Cramer Inc. performed the sheet metal and HVAC work for the medical center’s new $30 million Reinhart Emergency Trauma Center. They served as lead coordinator for the project’s building information modeling (BIM) and 3-D MEP coordination. The project replaced the existing emergency department with two emergency sections, adult and pediatric. It was a single-story expansion and renovation to the city-owned hospital. It added a brand new pediatric emergency department and a new lobby, plus support space. The new expansion included 48 exam rooms, eight triage rooms, four trauma bays, 12 critical decision unit rooms, a CT scan room, and two radiology rooms. Dee Cramer Inc. installed the building’s HVAC system, including two air handling units (AHUs) in the lower-level mechanical room. The air distribution system is a ducted supply-and-return system. The contractor installed variable air volume boxes with reheat coils on the supply side. 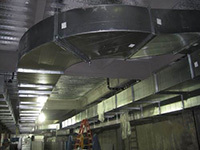 The exhaust systems consisted of general toilet, lab, and isolation room exhaust incorporating HEPA filtration. Mr. Cramer has been an IPD leader for years, since he took part in health-care consulting firm KLMK Group’s Thought Leaders Group in 2008 that studied the intricacies of integrated project delivery. Dee Cramer is currently in construction on their 5th IPD project. “Overall, the Hurley Medical Center IPD project was a remarkable success,” Mr. Cramer noted. It maximized state-of-the-art technology and exceeded participation goals. The thorough planning and exceptional communication of all contractors involved resulted in zero change orders and delivery with zero safety incidents. Even working around the functioning hospital, the job came in under budget, with all three phases completed ahead of schedule. All IPD team members enjoyed the experience and it more than exceeded the owner’s expectations. “It reduces changeovers, reduces rework, reduces waste on the project, and delivers a better project to the owner at a more economical price,” said Mr. Cramer.